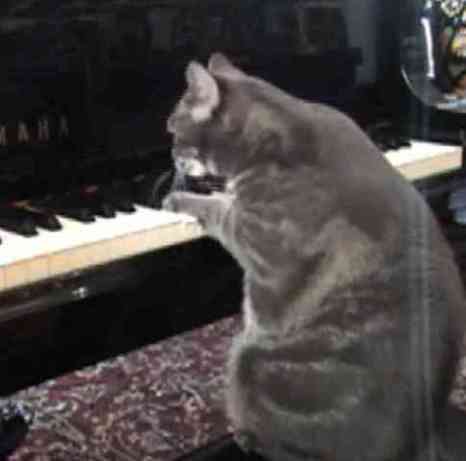 Nora The Piano Playing Cat: Practice Makes "Purrfect"
When Nora first came to live with Betsy Alexander and Burrell Yow!, it took her awhile to get settled. She was not thrilled with moving in with five other cats and had been labeled by the shelter as "bossy." Eventually Nora learned not to bait them and the other cats learned to give her a wider berth than they were used to with each other. Nora also developed her own special musical niche to help her connect with Betsy, a musician, and Burrell, an artist. She plays on a daily basis, whether there is someone there to pay attention to her or not. Of the two pianos in her home she prefers the Yamaha Disklavier. Her love for playing sometimes drive Betsy and Burrell a little nuts, but they adore her (and their other five cats). At the urging of Betsy's music students, Betsy and Burrell made a video of Nora playing the piano and posted it on YouTube. The students wanted to be able to prove to their friends that the stories they were telling about their music lessons were true. Betsy and Burrell wanted to be able to show off their cat to their niece in Wyoming. The cat became an overnight internet sensation and has gone on to additional videos, television appearances, and newspaper and magazine stories. Mindaugas Piecaitis, a well-known musician in Lithuania, has composed a chamber music "CATcerto" for Nora. The tabby takes part in the performances via video. Betsy has composed a piece called Fur Release: A Prelude for Paws and Hands that incorporates Nora's free jazz piano style. The title is a pun on Für Elise, popular piano composition by Ludwig von Beethoven. In case you are wondering, Nora uses both paws and plays both the black and white keys. She prefers the higher notes and the D-E-F range. At times she will lay her head on the keys as she plays, apparently loving the sounds she is making. Get Your Crazy Cat Lady Action Figure Now!